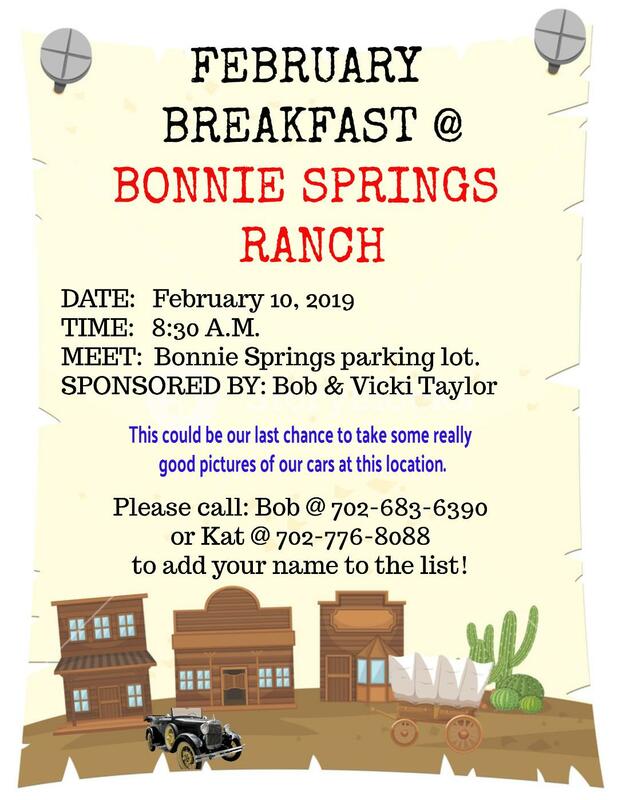 February 10, 2019: Breakfast at Bonnie Springs Ranch at 8:30 AM. Meet in the parking lot. 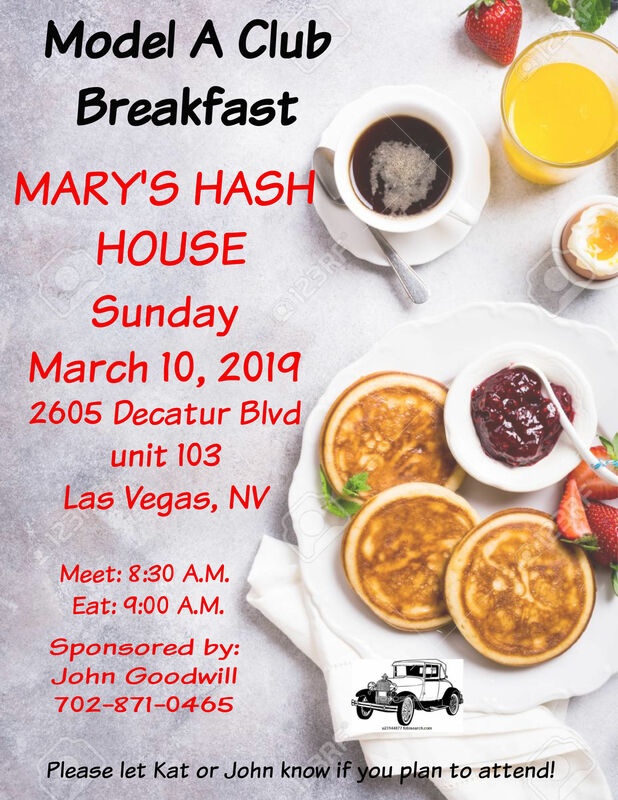 March 10, 2019: Breakfast at Mary's Hash House. 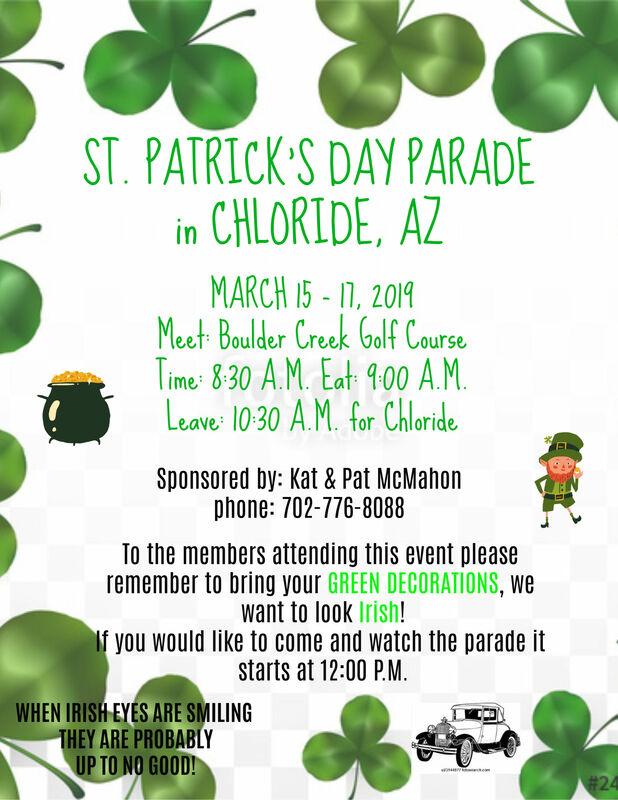 March 15, 16 & 17, 2019: Annual St. Patrick's Day Parade in Chloride, Arizona. Kat & Pat McMahon will host this event. For additional details see this flyer (click on flyer). 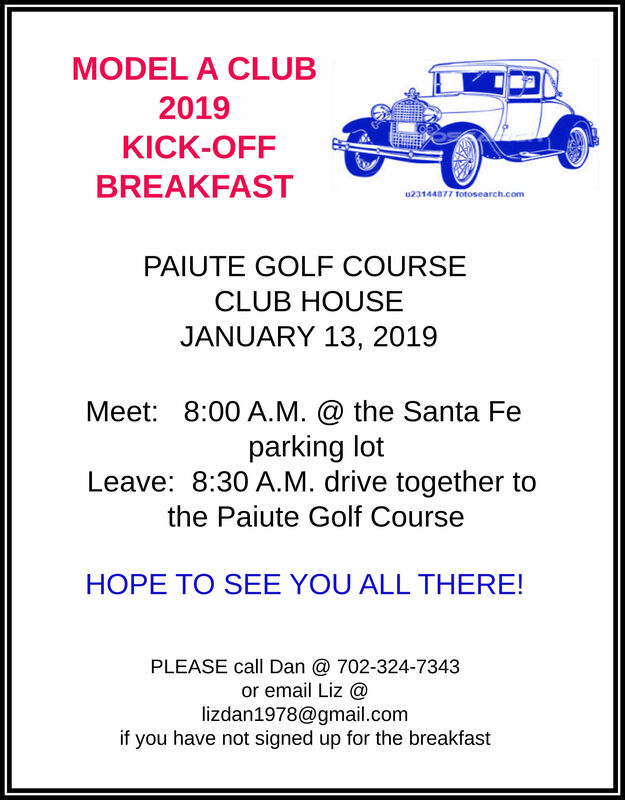 April 27, 2019, Breakfast at the Omelette House, 316 N. Boulder Hwy, Henderson, meet at 7:30 and breakfast at 8:00 AM. April 27, 2019, Heritage Museum Tour, 1830 S. Boulder Hwy, Henderson, head over after breakfast. We will be driving our cars and will be able to take pictures in front of the old homes. May 11, 2019, Helldorado Parade, 4th St. and Charleston, at 8:30 am. Breakfast after the parade at Main Street Station. May 19, 2019: Model A Family Picnic at Spring Mountain Ranch. Additional details to follow. Mt. Charleston Lodge. Additional details to follow. September 6-13, 2019: The Heritage Tour in Michigan without our cars. Contact Tony Gardner if you haven't signed up. Additional information will be provided soon. September 28, 2019: T & A Picnic at Sunset Park, details to follow. October 6-11, 2019: National Canyonland Tour, Kanab, Utah. Details to follow. November 9, 2019: Veteran's Day Car Show. Contact Jim Miller for details.